Saying good-bye to Christmas can be a sad thing. To me, the sight of a Christmas tree tossed in the street, forlornly awaiting the garbage pick-up, is one of the most depressing sights to be found in suburbia. As the lights come down and cities return to their ho-hum humdrum, it’s so easy to become nostalgic for the holidays. And in Spain, there is one more dark side effect to the passing of the Christmas season- the montecado, a glorious repository of sweetness, ceases to be sold in stores. 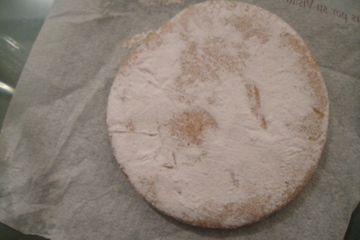 Montecados are essentially a kind of cookie, made up of super finely-ground almonds, flour and sugar (of course!) and butter or lard. Montecaods have been delighting Spanish palates since the 16th century! Since then, many varieties have developed, so in addition to the traditional cinnamon or sesame flavors, there are also lemon, chocolate, coconut, or hazelnut montecados. Also, over time they have become tightly associated with the celebration of Christmas- unfortunately for those of us prospective year-round consumers! 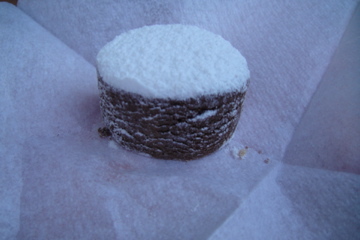 Polvorones are a type of montecado, sharing the same seasonal fate as the montecados. 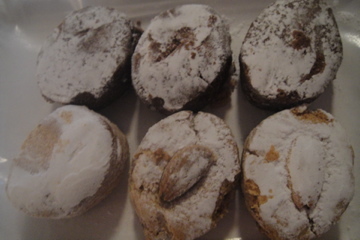 According to Wikipedia, polvorones have a different quantity of ground almonds than montecados, and are supposed to have a distinctive shape as well, supposedly more oval and elongated. However, we found them to be practically indistinguishable. Shopkeepers seemed to share the confusion, as we would often ask for one, and they would give us the other. 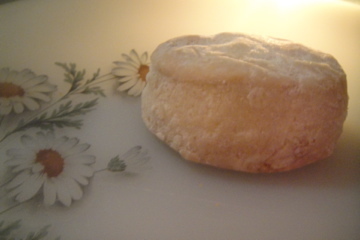 Also according to Wikipedia, montecados and polvorones can be found year-round in stores. This may be true. Perhaps, in the larger bakery operations and American-esque grocery stores, we could find boxes of our beloved cookies. But none can compare to the ones distributed by our little near-by corner bakery, which instantly crumbled upon touch (the “polvo” in “polvorones” translates as “dust”), and elicited audible sounds of satisfaction, as everyone “mmmmmed” and “yummmed” there way through their cookie, only to be left with a desire for more and an instant sugar high. Today was the day we found out the little bakery had stopped montecado production. It also happens to the be the one-month anniversary since Christmas. Though this post is a bit of a mournful remembrance, I’ll end on a bright note with the news that there are only 333 days, 10 hours, 58 minutes and about 50 seconds until Christmas! These are definitely cookies worth waiting for. I’m thinking about doing what you are; teaching abroad in Spain. I live in California and love reading your blogs. Keep it up! yum! my mouth is watering thinking about eating these while you were home. Come back!